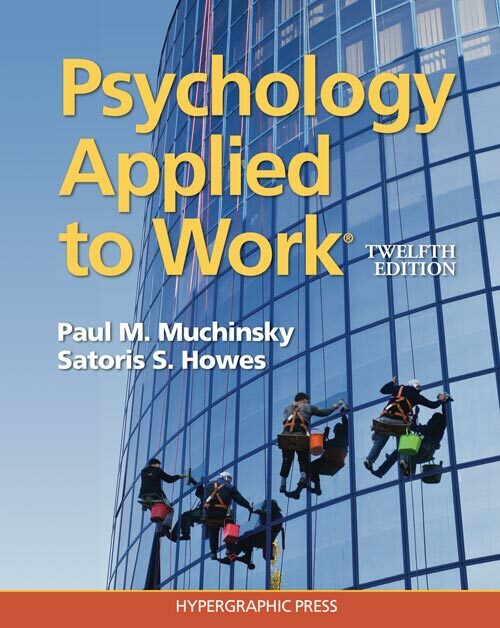 The 12th edition of Psychology Applied to Work® presents the story of I/O psychology as told through the most recent research, summarized in a focused and easy-to-comprehend manner. Each chapter presents five special features highlighting the impact of I/O psychology on key contemporary issues and designed to enhance student engagement in the field. Cross-Cultural I/O Psychology: The influence of various cultures and ethnic groups on I/O psychology and findings within the field. Social Media and I/O Psychology: The impact of social media sites and activities on the field of I/O psychology. Faces of I/O (new to this edition): Actual I/O psychologists showcased utilizing their knowledge and skillsets to make an impact on others. This feature serves as a form of networking, introducing students to scientists and practitioners who have a vested interest in I/O psychology and wish to share their love of the field. Tori’s Tidbit (new to this edition): Informal perspectives from Tori on the various topics throughout the book. Collectively these five features offer exciting new insights into how the field of I/O psychology is evolving in response to social changes. In addition, this current edition features new major sections on formal versus informal training, organization development, team structure, stress-management interventions and wellness programs, and strategic leadership. Combined with over 250 new references since the previous edition and updated examples throughout, this edition examines the past and present of the field and offers students a glimpse of the future.